Fig. 1. Plan of sampled area of Kh. 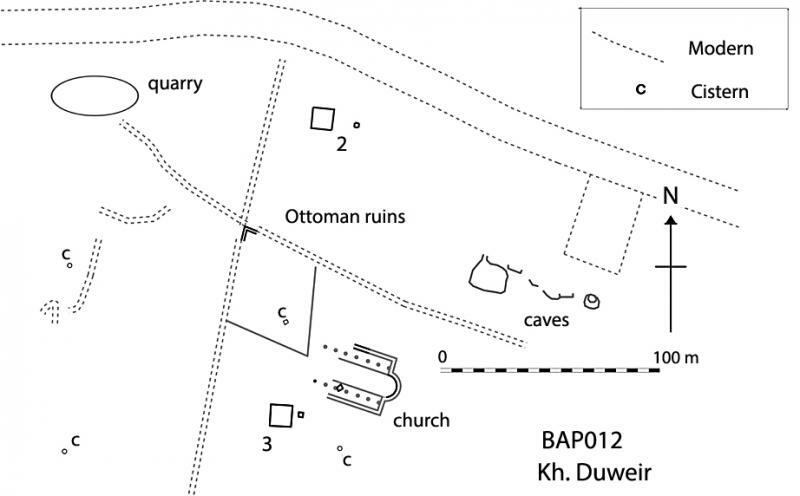 Duweir, showing proposed church (SE corner of church at 750097E 3590096N) and sounding squares 2 and 3. Fig. 2. Interior of one of the subterranean house/stable units at Kh. Sittat. Fig. 3. "Conder's Circle" in a steep-sided valley just south of Khirbet el-Mukhayat and 6.25 km west-northwest of Madaba. The excavators date it to the Late Chalcolithic/Early Bronze Age and regard it as unique. The narrow dividing wall is a Byzantine boundary wall unrelated to the original structure. Fig. 4. Byzantine tower 1.5 km north of the major Roman and Byzantine fort and town of Umm er-Resas. In this view, looking northeast, one can see the tower (scaffolded for restoration) with associated rectangular enclosure; the church on its northwest side (left); and, to the south, a second complex of well-preserved structures. Further south (bottom right quadrant) is a group of quarries, some later converted for water storage. Fig. 5. Khirbet es-Suq, 8 km south of central Amman, showing the standing Ionic columns of a suspected Roman temple in an area of well-preserved monumental Roman mausolea. Fig. 6. Khirbat edh-Dharih in a tributary of Wadi el-Hasa in central Jordan is a well-known Nabataean site, 100 km north of Petra. It has been under excavation by François Villeneuve for many years. Fig. 7. Plan of the Great Temple site (M. Agnew). Fig. 8. Great Temple precinct; overview to south, 2007 (A. Joukowsky).